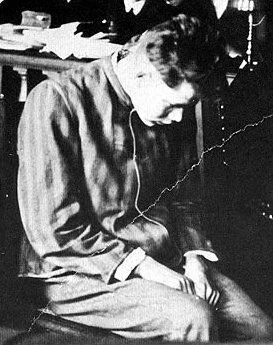 On this date in 1934, Dutch bricklayer Marinus van der Lubbe was beheaded by guillotine in Leipzig for setting the Reichstag Fire. A watershed event* in the formation of the Nazi dictatorship, the Reichstag fire days before a parliamentary election enabled Hitler to stampede voters, suspend civil liberties, suppress left-wing parties on grounds of a suspected Communist plot, and seize “emergency” powers he would never relinquish. This clip from an American miniseries on Hitler with the characters chattering in unaccented English portrays the fascists’ opportunistic use of the attack on a national symbol … something not exactly unknown to later generations. Van der Lubbe, who was arrested on the scene, suffered the predictable fate. Four other Communists charged as accomplices were acquitted, in a trial with the gratifying spectacle of Hermann Goering personally testifying, and being undressed on cross-examination by one of the reds. One is reminded here that Hitler did not yet have everything in the state apparatus at his beck and call … although he did have a great deal already, inasmuch as the arson law under which van der Lubbe died was passed after the Reichstag fire and made retroactive. 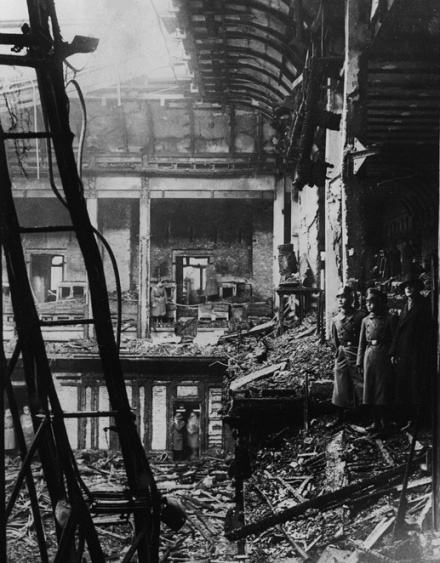 If the big-picture outcome of the Reichstag fire is pretty clear-cut, its real origin and the corresponding rightness of the judicial verdicts have remained murky ever since. The fact that the scene of the crime became Nazi ground zero for the next decade sort of obscures the evidence. Van der Lubbe confessed, so his participation is generally taken as a given. Whether he was really able to start the blaze acting alone, as he insisted, and the Nazis “only” exploited this fortuitous calamity; whether he was part of a larger leftist plot, as his prosecutors claimed; or whether, as Shirer and many others since have viewed him, he was a patsy in a false flag operation set up by the Nazis with an eye towards creating a politically advantageous national emergency — these possibilities remain very much up for debate. I do not see that one can blame the majority of Germans who, in 1933, believed that the Reichstag fire was the work of the Communists. What one can blame them for, and what shows their terrible collective weakness of character … is that this settled the matter. With sheepish submissiveness, the German people accepted that, as a result of the fire, each one of them lost what little personal freedom and dignity was guaranteed by the constitution, as though it followed as a necessary consequence. If the Communists had burned down the Reichstag, it was perfectly in order that the government took “decisive measures”!